According to an announcement made by Chicago police spokesman, Anthony Guglielmi, Jussie Smollett has been arrested and now in custody. It is gathered that the “Empire” star is facing a felony charge for allegedly filing a false police report. It is also gathered that Smollett’s bail hearing will be taking place later today. However, his lawyer believes he has the right to be seen as innocent until proven guilty. “Like any other citizen, Mr. Smollett enjoys the presumption of innocence, particularly when there has been an investigation like this one where information, both true and false, has been repeatedly leaked,” Smollett’s attorneys said in a statement. 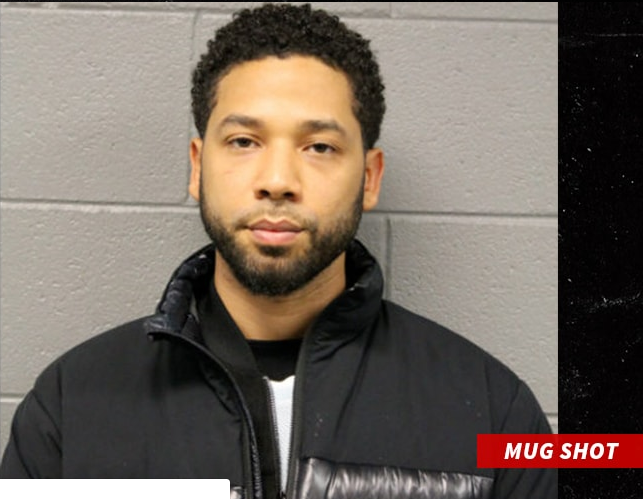 Smollett who turned himself in and is under arrest was booked and will be taken in custody to the courthouse where he will be going to bond court. He will either post bond or be released on his own recognisance. He will not enter a plea. According to the Superintendent, Smollett created the ruse because “he was dissatisfied with his salary” on “Empire. The Superintendent also said the wounds on Smollett were most likely “self-inflicted.” Not only that, it is believed that Smollett sent a “false letter” presumably the letter that was sent to Fox Studios eight days before the incident. A Cook County Grand Jury handed down Smollett’s indictment after grand jurors heard testimonies and evaluated evidence. There had been earlier reports that the two Nigerian brothers who were earlier arrested in connection to the Smollett attack, Ola and Abel Osundairo told Grand Jurors they staged the so-called “attack” at Smollett’s behest and even got paid for it. The brothers were caught on camera buying a bunch of supplies before the incident including ski masks, gloves, bandanas, sunglasses and red hats. It would be recalled that prior to Smollett’s arrest, the police officially called Smollett a “victim” until the police had real doubts about Smollett’s story. It was considered weird he kept the rope used during the attack on his neck for 42 minutes after the “attack,” and were suspicious when he took them to the scene and immediately pointed to a camera which he said captured the incident. Turns out, the camera was pointed in the wrong direction. The Nigerian brothers also told police they drove with Smollett in the days prior to the incident scouting a location and even rehearsed the “attack.” Law enforcement believes Smollett timed the “attack” for January 29 because he knew the Osundairo brothers were leaving for Nigeria that day.